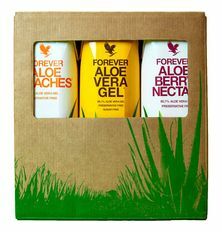 Experience Forever’s variety of aloe vera gel flavours in one convenient tripack. Each delicious flavour is made with precious hand harvested inner leaf aloe vera from our own plantations. Warning If you are pregnant, breastfeeding, planning pregnancy, taking any medications or are under medical supervision, please consult a doctor or healthcare professional before use. Aloe Vera Gel - Stabilized Aloe vera gel [Aloe vera gel (99,7%), vitamin C (ascorbic acid), antioxidant (ascorbic acid), acidity regulator (citric acid)]. Aloe Berry Nectar - Stabilized Aloe vera gel [Aloe vera gel (90,7%), vitamin C (ascorbic acid), antioxidant (ascorbic acid), acidity regulator (citric acid)], natural apple juice concentrate (4%), fructose, natural cranberry concentrate (2%). Aloe Peaches - Stabilized Aloe vera gel [Aloe vera gel (84,3%), vitamin C (ascorbic acid), antioxidant (ascorbic acid), acidity regulator (citric acid)], natural peach puree (8%), fructose, natural white grape juice concentrate, peach flavour.